In order to understand how these glasses work, we think it would be appropriate to talk a little about light. What is light exactly? Light is essentially an electromagnetic wave or radiation within the electromagnetic spectrum that is visible. Hence, this part of the spectrum is usually referred to as the visible spectrum. The primary source of light on our planet is the sun’s radiation. Sunlight contains various colors including red, yellow, orange, blue, green as well as multiple shades of such colors. This particular spectrum of light is what we call sunlight or white light. Without getting into complicated physics concepts, light rays with long wavelengths have relatively little energy compared to light rays with short wavelengths. On the visible spectrum, red and blue stand on the opposite extremes with red having the longest wavelength and lowest energy, and blue with the shortest wavelength and highest energy among visible light. Since blue light is at the extreme end of the visible spectrum, lights beyond it are not visible to the naked eye. These lights are ultraviolet radiation or UV for short. 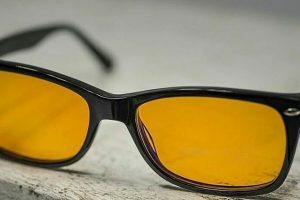 We all know that UV rays are bad for our eyes and since blue light is right next to UV, blue light can also have deleterious effects on our eyes. Blue light is approximately one-third of all visible light or high-energy light. Yes, sunlight contains blue light, but almost all other sources of blue light are emitted from flat screens, LED and fluorescent lighting. The problem is that the human eye isn’t particularly good at blocking high-energy blue light. It does, however, a fantastic job of blocking UV rays. Blue light, on the other hand, can pass through the cornea and reach the retina. Since blue light penetrates all the way to the retina, it can potentially damage light-sensitive cells that make up the retina. 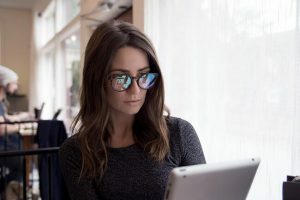 Although more studies or research is needed to determine how much is too much blue light and its varying impact on the eyes, we still know blue light can harm the eyes. With all of this in mind, it is difficult to ignore the harmful effects of blue light on our eyes, especially considering how much of it is absorbed. Since our eyes evolved according to the natural world, they are in no way capable of withstanding the current levels of blue light exposure. 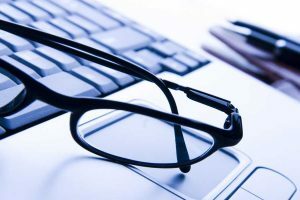 In fact, headaches and eye fatigues that are associated with blue light are increasingly common problems these days. That is why blue light filters are so important, especially if you spend most of your time in front of a screen. 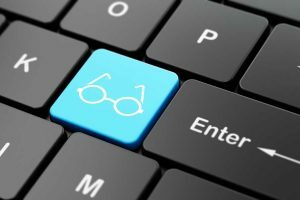 Blue light filters have been around for quite a while, but a recent addition has been computer eyeglasses. Such special glasses are meant to be worn while in front of a screen. They are available without a prescription for eyeglasses. They can even be prescribed if you already wear eyeglasses or contact lenses to correct your vision. 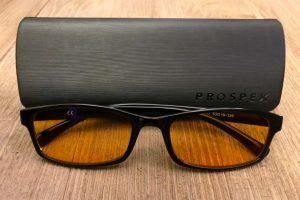 These glasses are specially designed to reduce some of the strain your eyes undergo while glued continuously to a screen. 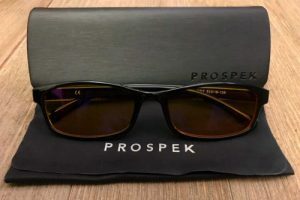 They are designed with an anti-reflective glass coating that is responsible for absorbing some of the glare, as well as the blue light that can disrupt your sleeping patterns and keep you up at night. 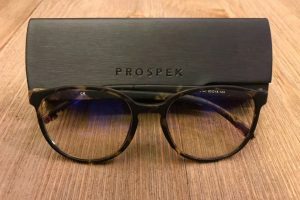 The manufacturers of these glasses also claim that their glasses contain filters that can protect your eyes from blue light associated with digital screens. As for the question, “Do blue light blocking glasses work?”, which to be honest is rendered moot, to begin with, the answer is “Yes”. However, blue light filtering eyewear won’t eliminate blue light completely. That’s a ridiculous expectation. They will just help in minimizing some of the strain from the blue light. The anti-reflective coating on these glasses can counteract blue light from a digital screen as well as natural blue light from sunlight. We also have photochromic lenses if we don’t wish to wear eyeglasses, which will protect our eyes from UV rays as well as blue light. I’ve been looking for glasses similar to these, thank you! Love the way these glasses look. I’ll have to give them a shot sometime!